Cathedral of St. John the Divine | Custom & Private New York Tours, Inc. The world’s largest Gothic cathedral, site of Sir Elton John’s 60th birthday party, a short presentation of the history, architecture, role in the community, the fire in 2001 and tour of the interior highlights, the challenges of the construction, beauty of the stained glass windows. There are seven 55 foot columns, milled in Maine, standing on foundations that are as deep and they are high! 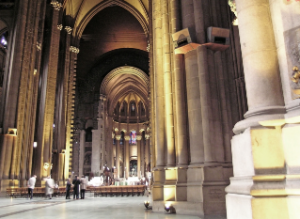 “This is huge!” Why was the world’s largest Gothic Cathedral created? Whose idea was that? What four 20th century leaders were chosen as the most significant of the century and adorned on the high alter? What gifts did the cathedral receive from Japan, China and The New York Times? Don’t miss this! This is a house of prayer for all faiths. I’ve seen Muslim services and even a Bar Mitzvah conducted there. This is something that most visitors don’t expect to see in New York City. The beauty and the enormity of this structure is truly one of the most impressive sites.